After just a couple of weeks we are over half way through Bolivia... Only about 400 km to go. A little confession, we are trying to get through Bolivia rather quickly... Not because it is not a beautiful and fascinating country, but rather because our stomachs are ready for some hygienic conditions that we hear are to be found in Argentina. As a result we are taking a rather direct route through the country, missing out on seeing the famous Salar de Uyuni and the Laguna region (almost criminal behaviour within the cycling community!). But we are nevertheless really enjoying our less travelled route through Bolivia. We are now in the beautiful city of Potosi, which sits at 4100 meters and claims to be the worlds highest city. The air is thin, but we are used to this by now! We had a fairly uneventful border crossing into Bolivia, we were quickly stamped out of Peru and after a bit of a wait stamped into Bolivia.... Then we were off, still hugging the shore of Lake Titicaca. To begin with the road was incredible with a wide and smooth shoulder, and the wind was great. But this all ended abruptly after 25 km or so, when the shoulder deteriorated and the wind switched directions...we pressed on and stopped for lunch in the town of Tiwanku. The town square was a sort of outdoor gallery, filled with stone sculptures. We investigated visiting the archeological site, but the price was too high... So instead we carried on, and eventually turned into the small village of Tambillo where we asked if there was a spot we could camp. It was a very warm welcome to Bolivia, the local police man was very kind saying we could camp anywhere we like. We ended up pitching our tent in the town square. As we were cooking dinner a woman came to chat, she was very concerned about how much wind there was where we were cooking... But we assured her that we had enough protection with the wind barrier for our stove. As we chatted some more, she admitted that she had really come over because she had locked her keys in her house, and she wanted Glenn to kick in her door! Luckily it didn't take much of a kick to do it, and the woman filled up our water jug as a thank you. We were in bed early, and had a very quiet night. The next morning we set off towards Bolivia's capital city of La Paz. The riding was not too hard, just a bit of a head wind and slight uphill grade to contend with. We eventually made it to the sprawling suburb of La Paz, called El Alto. This really is a city in its own right, and sits on the plateau above the valley that La Paz is situated in. When we made it through El Alto we began a 13 km descent into the city centre. We were headed for yet another Casa Ciclista in the heart of the city, and after missing our turn off, we did eventually find this lovely little apartment where cyclists come from around the world to rest up a bit. We ended up staying five full days in La Paz, longer than planned.... But this often happens when we find a nice place. When we first arrived we we quite surprised to find only two other cyclists at the Casa. We had heard stories of there being over 15 cyclists staying here at any given time, so it was a pleasant surprise to find it so spacious. This, of course quickly changed and about 13 other cyclists passed through during the time that we were there. Christian owns the apartment, and is a local cycling enthusiast, physicist, and generally a very nice guy. He charges a set fee of about $3 per person, per night and it is up to the cyclists to keep the place clean etc. We have stayed at quite a few Casa Ciclistas by now, and I have to say that I really appreciated the way that Christian runs his. Of course the mood and energy of the place fluctuates depending on who is there, but it is generally pretty fun ... And most people pitch in to keep the place nice. Perhaps the best part, was that there was a small oven.... So we were able to make pizza a couple of nights! This indulgence in way more cheese than our bodies are used to... Along with testing out a fair quantity of Bolivian wine (actually quite good! ), may have been in part to blame for our extended stay. We also took our bikes up to Gravity Bikes, a local bike shop / bike tour operator to have my front hub, which has been causing problems, replaced. In the end they did not have the part,but we did pay for a cleaning and re-greasing of our parts. The shop did an OK job.... But not quite as thorough as we would have liked..... Such is life. La Paz is a vibrant city with a rich art scene, so I between our wine and pizza consumption we were also able to check out some really interesting art, and even caught a free film! We finally made it out of the city, and to our delight we had the company of Marion and Mathias from Switzerland for a couple of days. To leave La Paz we had to retrace our route back up the 13km hill to El Alto... I was sort of dreading it, but it really wasn't so bad and we made it up in a couple of hours. The busy city continued for another couple of hours until we stopped for lunch... As we were eating some seriously dark clouds started rolling in. We were pretty sure that we were going to get very wet, and put on our rain gear. But, in the end we just had a few drops and a very strong tailwind! To make things even better, the road was being expanded and we had an unfinished, but paved lane all to ourselves! This made for some very fast riding. We eventually stopped in a small village and found another great camp spot in the town square. The next day we set off with Marion and Mathias and carried on along the road expansion lane. The conditions became a little more varied.... Everything from pushing up steep embankments, to riding in sand, to riding on smooth fast pavement... But it was fun. Marion and Mathias turned towards Sojama and the Chilean Border and we carried on. That afternoon we happened to notice a sign for thermal baths, 1.5 km off the road. We followed a rough road and came to a brand new building with a large warm pool along with several private small hot pools. For just $1.50 each we could enjoy a private pool, filled with new clean water and a lengthy hot shower.... It was pretty great to have our first bath in I'm not sure how long.... Also a little gross to see how much dead skin and grime came off us! We were able to camp beside the building, and enjoyed the company of two local boys. They told us that the thermal baths are owned by the community, and the building is only about a year and a half old. They also told us that they worked at the baths every night cleaning in exchange for free entry... But that as a result they never ate dinner or slept. This might have been a bit of an exaggeration, but we shared our food with them nonetheless. We woke up after a very peaceful nights sleep and made our way back to the main road after breakfast. It turned out to be a long day for us, as we rode all the way to the city of Oruro. We had intended to camp earlier and pass through the city the following day, but the 20-30 km before Oruro was nearly devoid of settlements and we were unable to find any water sources. When we got to Oruro we checked the prices at a couple of hotels, and were rather shocked to find they were in the $20-40 range.... Turned out we were in the wrong neighbourhood. We pushed our bikes through a busy market street to - yes - the other side of the railway tracks and found some very basic hotels in the $6-8 range. We settled on one, made some supper, and slept! Before leaving Oruro we stocked up on supplies in the busy market, and headed out along the shores of lake Poopo ( I think Bolivia must have the best lake names in the world). It was generally flat riding, passing through nearly abandoned towns. We had decided we would stop early, as we heard that there were more thermal baths in the town of Poopo. Unfortunately for us it was Sunday, and when we arrived in town both thermal bath complexes were very crowded. The one on the far side of town said that it would be no problem for us to camp, but asked that we wait a few hours to setup camp. Normally this would have been fine...but some very dark clouds and strong winds were rolling in, and it looked like it was going to pour rain any minute. We spotted an old church across the river and decided to head over there to see about camping. When we arrived it was extremely windy and dusty, and fortunately the family that lived at the church said that it would be no problem for us to camp on the grounds. We quickly set up camp, including our tarp, and waited for the rain to come... But, in the end we only got a lot wind and dust and only a little rain. We were pretty excited to get back into the mountains, even though we were already at about 3600 m along the altiplano... It was starting to get a little boring. We only had to fill up our fuel bottle with gasoline for our stove before heading out of town...unfortunately the gas station only had diesel. Finding gas has been a little more challenging in Bolivia than elsewhere. It seems that new federal regulations state that gas can only be sold to foreigners at three times the national price, this is not really a problem for us as it is still cheaper than gas prices in peru and we only need about a 1/2 litre every 3-4 days. The main problem is that most gas stations don't have the special receipts required to sell gas to foreigners (or can't be bothered to look for them...). So getting fuel to cook with usually requires a fair amount of begging and explaining that we will not be able to eat without it, and so on..... This morning was no different, an unfinished gas station did have some gasoline but could not sell...but after a little begging on my part one of the workers filled up my bottle and would not even let me pay for it! Finally we could leave town and were actually delighted to have some nice rolling hills and lovely scenery. We also had a sweet tailwind for most of the day. We decided to stop in the town of Tolpalca, mainly because our map did not show any other settlements for another 30 km. We asked at the health centre about camping, and the kind doctor offered us a room to sleep in. It was a quiet and restful evening. We were around 4000m, and although we were nice and cozy in our little room... There was a thick layer of ice on some buckets of water in the morning and the outdoor water tap was not yet thawed. Luckily, as the sun came out the ice quickly melted. We made our breakfast, packed up, and headed off. Today was one of the hilliest days we have had since around Cusco, constantly going up or down. But it was beautiful, the scenery was forever changing.... Deep red canyons, green hills, and rocky cliff sides. Our energy was beginning to dwindle around 3 or 4, and we spotted a school a little ways down the valley. We asked an old woman sitting watching a herd of llamas on the side of the road if there was a water source down there. She assured us that there was. There were also a few people, so I walked down to ask about camping. It turned out the schoolteacher was away, but the family figured it would be OK for us to camp in front of the school. We had another peaceful evening... Made a little more interesting by a full moonrise, and a small bottle of rum I had picked up. However, it turns out that drinking at high altitude makes you extra dehydrated and we both woke up in the middle of the night desperate for water! 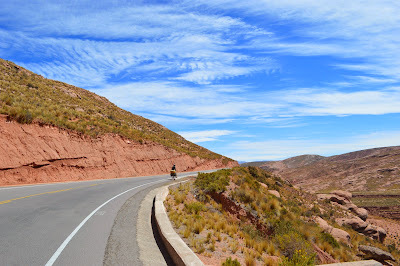 We thought we might make it all the way to Potosi the following day, but we also knew we had some climbing to do. The road first dropped about 800m, which was great fun... Then it climbed steeply up another 300 m. Then we rolled up and down for some time. When we reached the town of Tarapaya, where we knew there were some hot springs (can you tell we like hot springs!) we decided to check them out, and maybe camp. We had to take a dirt road uphill for a few kilometres to reach a warm lagoon called 'Ojo del Inca', apparently made into a circle shape (eye) by Incans. It cost $1.50 each to swim, but they wanted another $3.00 each to camp there. We decided just to have a swim, as they did not have any fresh water (only thermal, mineral water), and we did not have enough water with us for cooking. It was a beautiful setting, and very lovely to have a warm swim. Unfortunately, we decided to take a short cut to leave around the lagoon.... but it took us over a couple small veins of water. I thought I could just cruise across, but the first one was a little deeper than it appeared...and I had a good crash, and I also got a foot soaker (which I remember getting very frequently as a child). After picking myself up we carried on down the hill in search of a camp spot with a water source. As we were investigating the seemingly abandoned town square we saw two cyclists riding past... It was Margit and James! They had rode like the wind and caught up with us, and what a fluke that we met them here! We ended up camping with them that night at the local (also seemingly abandoned) school. Just as we were settling into our tents the lights on the sports court came on, and a large group of teenagers and kids also came! We talked to the older guy who called himself the director, and apologized for not asking about camping, but explained that we couldn't find anyone. He said it was no problem at all, so we settled back into our tents and listened to the lively game of football! The next morning we climbed up to Potosi with Margit and James, it only took a couple of hours to do the 700 m climb, but it was steep in sections, particularly as we go into the city centre. We spent awhile looking for a place to stay, and like it Oruro it seemed that the options were either way out of our budget or super basic. We did eventually find a nice place with a nice price.